Do you want to be buried or cremated? It’s a conversation every family should have with their loved ones. One of the funeral profession’s oldest debates is when families at the funeral home have to choose between burial and cremation. You’ve likely heard someone say something along the lines of “just cremate me” or “just bury me”. However, if you don’t take the time to look at different methods of disposition and talk about it with your family, you could be setting them up for disagreements about what you would’ve wanted. Rather than leaving it up to them to wonder if they got it right, take some time to look at both options and talk about it with them. Burials and cremations each come with pros and cons so it’s an important decision to make. For many families, burial has long been the traditional way to care for a loved one’s remains. In recent years though, the popularity of cremation has risen. In fact, cremation rates in the United States now exceed 50%. Experts at the National Funeral Directors Association are predicting that by 2035, more than 70% of people who die will be cremated. Deciding how to care for a loved one’s remains or you own (if preplanning) is an important decision. 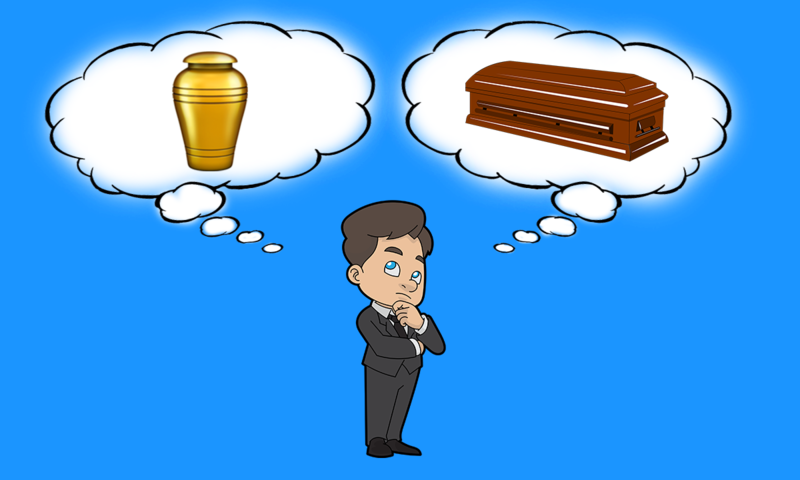 To help you understand the pros and cons of cremation and burial services, we’ve compiled some helpful information below. The only information we can’t offer you is whether you should be cremated or buried. That’s a choice that only you and your family can make. Typically, a cremation service costs less than a burial service. At most funeral homes, a cremation service is about one third the cost of burying a loved one. One thing to keep in mind is that both types of services carry additional expenses which will impact the total cost. For instance, a direct cremation may only cost about $1200, but when you add the cost of an urn or memorial service, the price will increase. Comparatively, a traditional funeral service and burial could cost around $7700. However, if you choose to forego a funeral and plan a direct burial, the costs will be reduced. A funeral service can still be held before or after the remains have been cremated. It’s more affordable. Cremations don’t require you to purchase items like caskets, vaults, or grave markers. It’s portable. If you ever need to move, you can bring the ashes wherever you go. Families have more time to decide how to honor their loved one. Once the remains have been cared for, your family can spend time planning a memorial service or celebration of life. It’s considered more environmentally friendly and has little impact on the Earth. Provides a permanent place for loved ones to revisit. Watching a loved one’s burial can provide closure and peace. It is a traditional practice for some religions and respects the deceased’s beliefs. Many consider it a more natural method of disposition. Before you decide if you want to be cremated, make sure that your faith allows cremation. If you’re unsure, talk about it with your religious leader for more clarity. Traditionally, members of the Buddhist and Hindu faiths are cremated. Islam and Orthodox Judaism have a strict ban on the practice, however some Jewish people still choose to be cremated. The Roman Catholic Church lifted their ban on cremations several decades ago but still require the cremated remains to be buried afterwards. While your religion’s beliefs or laws for the deceased might not matter to you, it’s worth considering how others in your family may feel. Does The Cemetery Have Enough Space? Another important thing to consider is the cemeteries in your area. Something many people overlook is how much space is left in a cemetery. Cemeteries only have a finite number of plots available for burial. If the cemeteries in your area are nearly full, the cemetery may charge a premium rate for the remaining plots available. This can increase the total cost of a service and may take a larger chunk of your budget than expected. In many ways, a cremation service offers more flexibility and convenience. If you family is spread out, it can be difficult to make travel arrangements quickly for everyone to gather for a visitation, funeral and burial service. Instead the remains can cremated immediately following death and eliminate the pressure to gather together quickly. Your family can have the remains cared for before planning a time to honor your loved one when everyone can be there to attend. It’s actually quite common for families to hold a celebration of life or memorial service weeks or even months after the remains have been cremated. Cremated remains can also travel or be easily divided among family members. If you ever need to move, its much easier to bring an urn with you than have the remains transferred to another cemetery. The ashes can also be easily divided among family members. This lets family members choose what they want to do with the remains. Some people may have the ashes added to a piece of memorial jewelry while others may wish to store them in an urn or scatter them in a special place. This entry was posted in Funeral Advice, Funeral Planning Resources on January 16th, 2019 by ObitTree .